The complex world of neurology and the treatment of neurological disorders and conditions demands commitment, training and years of experience. All of our specialized physicians and neurologists exemplify this as well as a keen understanding of the inner workings of the human brain and central nervous system. In addition to its highly trained staff, the Neurology Center at both Samitivej Sukhumvit Hospital and Samitivej Srinakarin Hospital is equipped with cutting-edge medical technology. Neuroscience is a rapidly developing field and we make sure that we stay at the forefront of the latest medical trends and advances. 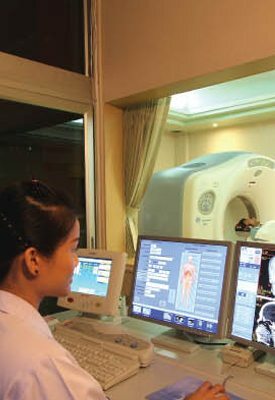 Our equipment includes the most up-to-date Computer Tomography (CT) scanners, Magnetic Resonance Imaging (MRI) devices and Electroencephalography (EEG) devices available. Our specialists are prepared to treat everything from mild headaches to epileptic seizures, dementia or strokes. We help our patients along every step of their treatment, from early diagnosis to intensive care to rehabilitation and follow-up visits. Examinations, diagnoses, treatments and prevention for patients with an acute or chronic symptoms of the following such as weakness in a part of body or the whole body, pain, abnormal movement, transient abnormal behavior, memory deficit, fainting, spinning head, headache, numbness, tingling, etc. Asst. Prof. Sittichoke Anuntaseree, M.D.